CIRACLE Secret Sebum Powder 5g. Home » Make Up » Powder & Pact » CIRACLE Secret Sebum Powder 5g. Product Code: CIRACLE Secret Sebum Powder 5g. RecommendIf having a combination/oily skin becomes an issue and what to resolve this.If you want to control sebum secretion all year round to stay fresh-looking day or night.If you want to have softer and better skin complexion like a baby's bottom.If matte finish makeup is what you prefer.If you are always out in the sun and need your makeup intact all day. FeaturesHaving an oily face can ruin not only your makeup but possibly your day.And unfortunately, during the summer months, our face just becomeseven oilier or greasier due to intense humidity and powerful Mr. Sun. It's said that it's best to stay indoors during the hours of 10am-3pm,when the sun is at it's strongest. But, if you really have to be out andabout, remember to wear your sunblock with the highest SPF PA++ orPA++ for ultimate UV/UVB protection and don't forget Ciracle SecretSebum Powder in your bag ! ... so what makes Ciracle Secret Sebum Powder special? 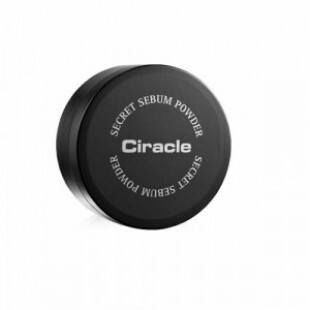 Since you know that you could end up looking like a grease-ball in summer,make sure to have the best oil absorbing face powder in your purse !Ciracle Secret Sebum Powder is colorless and would suit all skin types.You never know when you need the power of one tap of this powder puffto keep your face looking fresh all day without ruining your makeup !This beauty secret is no longer a secret since you can carry thisoil absorbing face powder with you, anytime, anywhere ! How to use1) Pat lightly on oily area of the face such as T & U-zone and nose with the puff as the final step of makeup.2) Re-apply as of when is required.3) Carry this oil absorbing face powder with you while on the go for a quick touch up.